Signed from junior side Ashfield along with Jim Cameron and Gerry Hernon in November 1966, Walter made his first team debut four months later against Kilmarnock at the age of 19. At the end of that season he was part of the 16 man squad that travelled to the USA after United were invited to play as Dallas Tornado in the United Soccer Association. His first four years at United were spent mainly in the reserves until he broke into the side in 1970-71, when he became a regular in the line-up. He played in the first Scottish Cup final in 1974 but fell out of contention soon after, and in September 1975, he left to join Dumbarton for a fee of £8,000. Eighteen months later, he returned to Tannadice for half of that fee and played regularly over the rest of that season. In 1977 Walter suffered a pelvic injury which threatened his career at the age of 29, limiting his first team appearances over the next few years. He was given a player/coach position by manager Jim McLean, and by 1979 he was assisting with coaching the Scotland youth squad. Still appearing occasionally as a player, his last first team match was in September 1980. 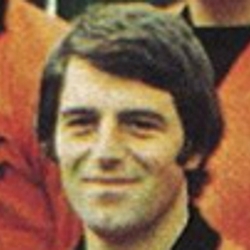 Smith was first team coach as United entered the most successful period of their history, winning two League Cups and the Premier Division title in the early 1980s. He went on to become the national Under-21 coach and then assistant manager to both McLean at United and to Alex Ferguson in the Scotland set-up, and was elevated to the Tannadice Board in February 1986. However in April 1986 Graeme Souness appointed him as his assistant manager at Rangers, eventually replacing Souness as manager in 1991. After a successful seven years at Ibrox, he was manager at Everton for four seasons, and after a short spell as assistant manager at Manchester United, he was appointed manager of the Scottish national team in 2004. Two years later he returned to Ibrox where he spent another four seasons as manager before retiring in 2011. Walter was born on this date in Lanark. Dundee's run of 29 competitive games without defeat came to an end thanks to a rare goal by Walter Smith. The Tangerines always looked the more likely side in a typical derby contest in which both defences looked shaky. The goal which decided the match came after 67 minutes. Jim Henry chased down the left and crossed to the far post where Walter Smith shot low into the net. Trailing 2-1 from the first leg at Fir Park there was pressure on the team ahead of this third round second Leg tie. There were three changes from the team that defeated St Mirren on Saturday, with Frank Kopel, Graeme Payne and Billy Kirkwood making way for John Holt, Iain Phillip and Willie Pettigrew.